Thanks so much 🙂 It was challenging to say the least… I’m really glad it worked, but I won’t be doing it again any time soon. 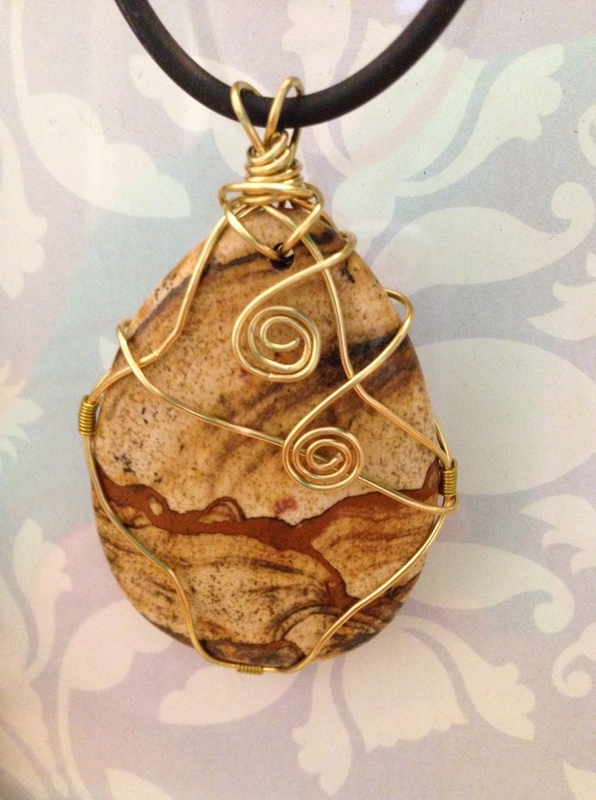 It turned out great for your first attempt at wire wrapping, and I love that stone pendant its beautiful glad you were able to use it in a way that it can be seen by others, it would be a shame to hide any of its beautiful. Thanks muchly for your kind words! This looks wonderful! At least you get something beautiful and wearable after all the hard and frustrating work!!! For the first time… would never have guessed!! (: Good job!! I love the colours… to die for with a wooden neck strand or two… Haha I agree wiring Is definitely a character tester :D. The smaller the pliers the easier… my favourite is the needle nose, going by the youtube video… the one she uses is too thick for me… Hope that helps. Michael. Thanks so much! I love the result but I’m not sure my sanity would survive another try smaller pliers would be much easier, for sure! Thanks so much! Lol, new hobbies are a little addictive 🙂 your stuff is lovely!